Suite 100 … 966 Sq. Ft.
Suite 201 … 1,162 Sq. Ft. If you are looking for notoriety and visibility, this is the location for you. This is the newest building on Odana Road. Located only ½ block from the entrance to West Towne Mall, over 22,000 cars per day go past this building. An expansive two-story entry and lobby welcome tenants and employees. An elevator or open stairway provides access to the second floor. The building features an exterior sign box for all tenants. Extra sign locations available at an additional charge. Ample surface parking to allow your customers close parking. Storage is available in a lower level that is accessible by elevator. 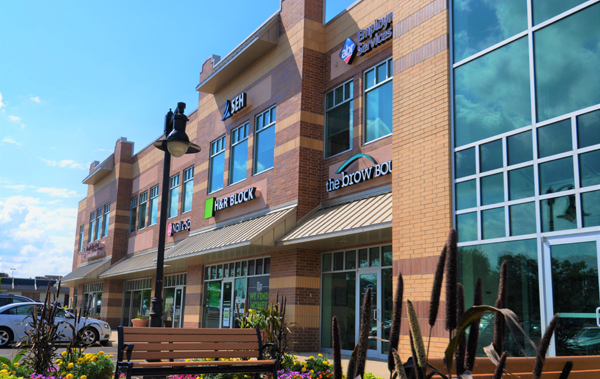 Download a Town Center Square leasing sheet (PDF) for more information. Suite 100 – 966 Sq. Ft.
$15 TI allowance from a warm gray box with 5 year lease. Suite 201 – 1,162 Sq. Ft.
Office includes five private offices and a reception area. This could be a short term sublease until 9/30/19 or a new longer term lease.